If you’re still taking a compact camera on your travels, you’re now virtually on your own. Go to any tourist hotspot and you’ll see not compact cameras, but smartphones everywhere. It’s a revelation we at TravGear welcome; what better way to travel light? However, the power of optical zoom lens that you forego by using a smartphone rather than a proper compact camera is a huge shame. Sony’s DSC-QX10 tries to change all that. The DSC-QX10 is actually a standalone camera without the body. As well as the 10x optical zoom lens (25-250mm f/3.3-5.9), the 138g circular lens unit contains a tiny microSD card slot. It’s actually pretty useless; if you use the DSC-QX10 while it’s not connected to a smartphone, this microSD card stores all photos. However, the whole point of this unit is that it is used with a smartphone – and, happily, it can be used with either Android or iOS devices. If you’d be happier using a tablet as your main photography device while on your travels (if you are, we’re all staring at you, pointing and laughing), search out the pricier DSC-QX100. 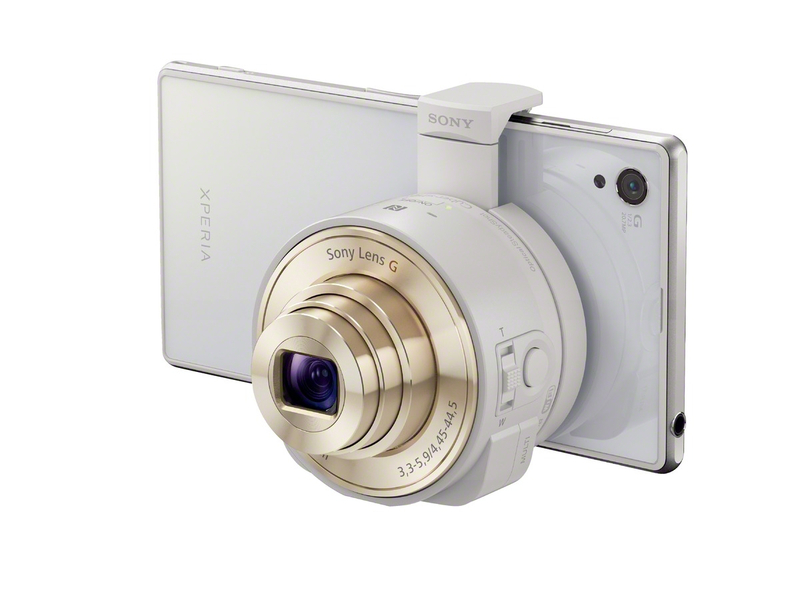 Shooting in 18-megapixel quality (so more than twice what an iPhone is capable of) and with a powerful 10x optical zoom complete with image stabilisation, the DSC-QX10 attaches to a smartphone using fold-out clips. It’s actually very easy to do, with one of the clips spring-loaded, and both having tiny teeth to grip to the nearside of the smartphone’s screen. However, it doesn’t work well if there’s any kind of phone case in place. The DSC-QX10 is charged-up using a supplied micro USB cable using a slot that’s hidden under a small flap on the side of the lens. After that’s done, it’s a question of tethering a smartphone to the DSC-QX10. This is pretty easy to do, and relies on linking to a Wi-Fi Direct network produced by the lens itself. Go to your phone settings and link to the device, and you’re good to go. All that can be can be done by just a tap if you have an NFC-compatible Android phone. However easy it is to link, each time the DSC-QX10 is used it’s necessary to repeat that long-winded procedure; where’s the automatic re-link that Bluetooth gadgets now feature? It’s sadly missed here, and makes using this accessory a bit of a faff. To control the DSC-QX10 you will need to also download this free Sony Play Memories Mobile app for iOS or Android. It’s possible to control the physical actions of the zoom lens as well as the taking of pictures just by using your smartphone’s touchscreen while the app is open, though it’s not very reliable; better to use the hard buttons on the lens itself. Either way, the end results and up in the smartphone’s camera roll. Though that Play Memories Mobile app does try to present a lot of options – primarily the Intelligent Auto, Superior Auto, and Program modes – only some of the on-screen elements are touch-able. For instance, though the exposure levels (in Program mode) can be changed, neither the megapixel rating nor the aspect ratio (16:9 or 4:3) can be changed by touching, and no mode allows the manual setting of ISO speed or exposure compensation. Most compacts do offer at least that. However, the real problem isn’t the lack of ambition, but a lack of speed; pictures take a few seconds to focus, with the whole system hanging far too often. It might have a cute design, but even when it’s clamped to the back of a smartphone the DSC-QX10 isn’t as functional or as care-free to use as a decent compact camera. Since the DSC-QX10 has a flat bottom that also features a tripod plug, it can be divorced completely from your smartphone, the clips snapped back into place, and used as a remotely controlled camera. Keep the app open and the Wi-Fi Direct connection live, and the DSC-QX10 can be used for taking a selfie photo or video – or perhaps even a piece to camera while you’re standing in front of an iconic building or view. Though it’s clearly aimed at travellers, and it’s highly portable at just 105g and 62x62x33mm, the DSC-QX10 strikes us as a little delicate for a life on the road. It badly needs not only a small drawstring bag for scuff free trips, but also something with padded protection since it’s likely to spend most of its day in a shorts pocket or in a daysack. The results are really good – it’s just so useful to have a powerful zoom on hand when you’re standing in front of something stunning that a smartphone on its own just won’t do justice to – though we did have some problems with the auto-focus, as well as the lack of processing power. we also weren’t exactly blow away by the DSC-QX10’s performance in low light. The DSC-QX10 is a great piece of portable kit, but it’s too slow to communicate with the Play Memories Mobile, and linking to a smartphone is long-winded; great for photography sessions it might be, but you disconnect it and put it back in your pocket at your peril. However, our biggest concern is battery life. A fully charged DSC-QX10 lasts just 110 minutes for photos (or 220 photos), or a 65-minute movie, and necessitates taking a micro USB cable (you’ll also have to supply your own USB charger) on your travels, too. The DSC-QX10 doesn’t come across as a travel essential; you’re probably better off spending about the same kind of money on a rugged, waterproof compact camera since the results will be better. Nice idea and worth persevering with, but technically speaking, the DSC-QX10 is, for now, largely pointless and not yet good enough to revolutionise your travel photography.